(Bloomberg) -- For the first time since 2014, China’s new stocks could go either way on their trading debut. In the country’s volatile equity market, one thing’s been a certainty: initial public offerings are valued at no more than 23 times earnings and always pop 44 percent on their first day. The trade is so predictable that IPOs are often thousands of times oversubscribed, regardless of what the company does or what its prospects are. A new exchange board in Shanghai is about to change the game. New listings won’t be subject to the valuation restriction and pricing will be instead determined by the market. Analysts say this year’s dearth of debutantes in China -- its slowest first quarter since 2016 -- and the surging stock market make it likely that IPOs will price at the upper end. But where the stock will close on its first day will be anyone’s best guess. As the latest attempt by officials to get the next superstars trading onshore, the new board will also be the first to welcome firms that are yet to make a profit. Though China has plenty of locally cultivated technology companies, many well-known names like Tencent Holdings Ltd. and Alibaba Group Holding Ltd. are listed abroad. Entrepreneurs who go public in China are left with no choice but to pocket an artificially low amount and then watch their shares soar. The restrictions were introduced to protect mainland investors from buying into firms at inflated prices. (State-backed firms are the rare exception to the valuation rule.) But in practice they’ve prevented Chinese individuals from owning a slice of some of the country’s most successful stocks. A plan to bring tech stars home via Chinese depositary receipts was iced last year as Chinese stocks tanked. The Shanghai Composite Index has jumped 29 percent this year, closing above 3,200 points Wednesday for the first time since May. The China Securities Regulatory Commission didn’t respond to a faxed request for comment on whether its plans for CDRs remain on hold. A call to the regulator went unanswered. The guidelines for Shanghai’s new Science and Technology Innovation Board were finalized a month ago. Along with the looser rules on valuation, first-day trading and earnings track record, regulators also reduced the lockup period for core technical personnel to one year from three years. Some analysts expect the listing process to be completed as soon as June. Investors were unimpressed with the first batch of applicants for the new venue, saying last month that the companies were similar to the small caps already trading on Beijing’s over-the-counter exchange. 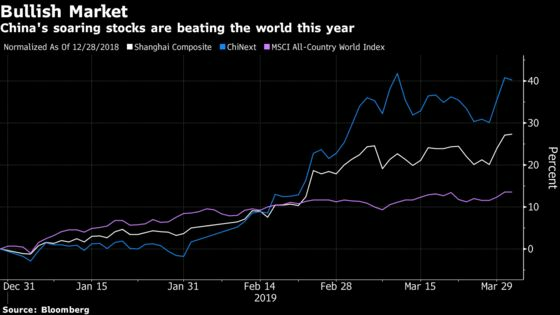 The hype was for something more akin to the Nasdaq in the U.S. -- or at least the ChiNext board, home to this year’s top-performing Chinese stocks. The Shanghai exchange has accepted 37 applications for the tech board. That includes Qingdao Haier Biomedical Co., a company that had initially filed for a Hong Kong listing. While a quick buck won’t be guaranteed, this year’s tight IPO supply makes it more likely that the first listings will trade higher, according to Zhu Zhenkun, an investment manager at Cinda Securities Co.’s asset-management unit. “There’s likely to be a lot of speculative trading in the early stages,” he said.